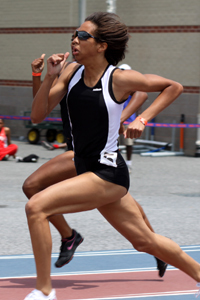 The end of the 2014 outdoor track season marks five years since MoCorunning.com published the All-Decade Teams (Boys, Girls) which celebrated the best T&F athletes who participated in Montgomery County, Maryland between 2000 and 2009. The next all-decade team will be a more manageable project if there is a halfway checkpoint. Hence, this project is called the "Half-Decade Team" to celebrate the best T&F athletes who competed in Montgomery County between 2010 and 2014. MoCorunning editor, reporter, photographer, keeper-of-statistics, and track & field fan Kevin Milsted researched and nominated 40 boys and 40 girls for consideration for this Half-Decade Team. Coaches with more than 5 years of experience in Montgomery County were asked to review MoCorunning's nominees and vote for the most deserving 20 boys and 20 girls, ranked in order, based on whatever criteria was most important to him or her. The 20 athletes with the highest score based on the coaches' votes are now shown here as members of the MoCorunning Half-Decade Team. Coaches were asked to "write in" 2 additional boys and 2 additional girls which were not already nominated by MoCorunning. The athletes with the most write-in votes were added to the honorable mention list along with the other nominees. The following coaches contributed to this Half-Decade Team. Without their thoughtful consideration of each athlete, this project would not have been possible. 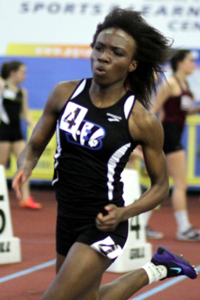 Notes: Ranks #1 All-Time in Montgomery County in the 55m, 60m, 100m, 200m, and 400m. Holds four of top seven 400m times ever recorded at the Maryland State Championship Meet including the state record. Won 14 individual state titles and 6 relay state titles. Holds 4x400m state meet record. Was 7-time individual high school All-American. Competes for Texas A&M where she was recently named SEC Runner of the Year for sweeping conference titles in the 100m (11.11) and 200m (22.23). 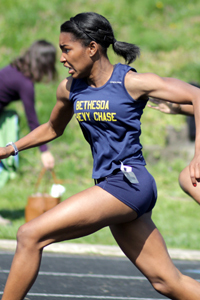 Is the second fastest US collegiate woman of all time at 200 meters. Notes: Ranks #1 all-time in Montgomery County in the triple jump. Ranks #1 in the high jump, #4 in the 55m hurdles, #4 in the 100m hurdles, and #4 in the long jump in Montgomery County from 2010 to 2014. Scored 40 points at 3 county meets, 2 region meets, and the 2011 outdoor state championship meet. Won triple jump at the Penn Relays and New Balance Outdoor Nationals. Was 5-time high school All-American. Competes for University of Maryland where she is ACC Champion in the triple jump, 2-time ACC Champion in the pentathlon, and 4-time qualifier for the NCAA Championships with personal best marks of 43-06.50 triple jump, 6-00.75 high jump, 20-02.50 long jump, and 8.53 60m hurdles. Notes: Ranks #1 all-time in Montgomery County in the shot put and discus. Holds indoor county championship meet record in the shot put and outdoor county championship meet records in the shot put and discus. Recorded the #4 all-time best mark at the indoor state championship meet and the #6 all-time best shot put mark at the outdoor state championship meet. Finished 2nd at the Penn Relays and 7th at New Balance Indoor Nationals in the shot put. Notes: Ranks #1 in the 55m Hurdles dating back to 2007 and likely ranks #1 all-time in the 400m Hurdles in Montgomery County. Ranks #3 in the 300m, #3 in the 400m, #3 in the 100m hurdles, and #3 in the 300m hurdles in Montgomery County from 2010 to 2014. Owns five individual state titles and a 4x400 relay state title. Placed second in the 400m hurdles at the Penn Relays in what is likely the fastest time ever recorded by a Montgomery County athlete. Competes for the University of Louisville. 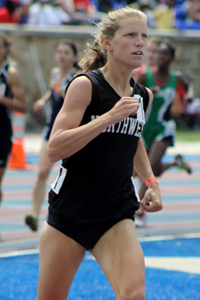 Notes: Ranks #2 in the 1600m and #4 in the 800m in Montgomery County from 2010 to 2014. 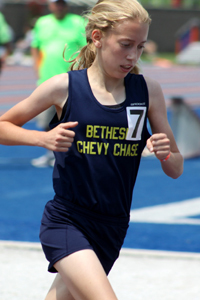 As sophomore, swept indoor and outdoor 800m and 1600m state titles. Recorded fastest 1600m time at outdoor county championship meet since 1996. Junior year, swept outdoor county, region, and state titles in the 800m. Notes: Ranks #2 in the 200m, #4 in the 400m, #5 in the 300m, #6 in the 55m, and #7 in the 100m in Montgomery County from 2010 to 2014. 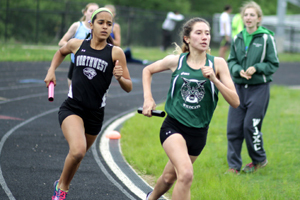 Was 8-time runner-up at Montgomery County Championship Meets behind Olivia Ekponé. Against 2A/3A competition, won 300m state title and three 200m state titles. Competes for Hampton University where she is two-time 200m conference champion and two-time Honorable Mention NCAA All-American with personal best times of 11.92 100m, 23.15 200m, 39.21 300m, and 54.12 400m. 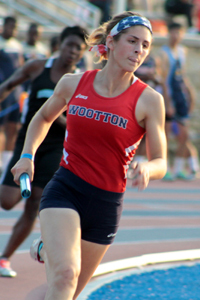 Notes: Ranks #2 in the 500m and 800m in Montgomery County from 2010 to 2014. Won 2011 outdoor 800m state title by over 4 seconds. Contributed to 31 of Northwest's 36 county, region, and state titles in relay events between 2009 and 2011. Won 11 state titles on relays including 4 in the 4x200, 4 in the 4x400, and 3 in the 4x800. Additionally won 12 county titles and 8 region titles on relays. Currently starts at goalkeeper for perennial soccer powerhouse Penn State University. Notes: Ranks #2 in the 400m, #3 in the 100m, #4 in the 300m, #5 in the 55m, and #6 in the 200m in Montgomery County from 2010 to 2014. Ranks #2 in the indoor 200m (24.59) with emerging elite victory at New Balance Indoor Nationals. Won indoor 300m state title. 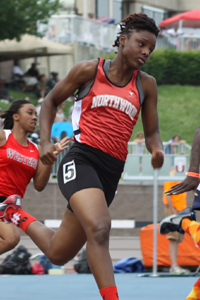 At 2014 outdoor 4A state championship meet, won 400m state title in #10 all-time state performance, finished runner-up in the 100m and 200m, and contributed to #3 all-time 4x400 relay. Notes: Ranks #3 in the 55m hurdles, #3 in the high jump, #5 in the 100m hurdles, and #5 in the 300m hurdles in Montgomery County from 2010 to 2014. Scored 40 points at the 2014 indoor county meet. Won state titles in the 55m hurdles and 100m hurdles. Finished 8th in the heptathlon at New Balance Outdoor Nationals. Notes: Ranks #1 in Montgomery County in the 1600m and mile dating back to 2007. Ranks #2 in the 3200m from 2010 to 2014. Split 2:13 on the state record-breaking 4x800 just hours before recording #7 all-time 3200m performance at Maryland state meet, 10:41.28. 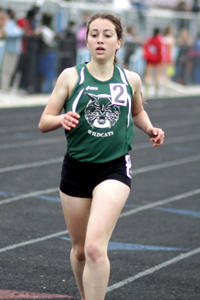 At the time, was the best 3200m performance by a Montgomery County athlete in 15 years. Now a graduate student, still has eligibility for Duke University where she has run 4:27.32 1500m, 4:52.64 mile, 9:47.49 3000m, and 16:30.42 5000m. Notes: Ranks #1 in the 3000m and 3200m in Montgomery County dating back to 1996. Ranks #4 in the 1600m in Montgomery County from 2010 to 2014. As sophomore, swept indoor and outdoor county, region, and state titles in the 3200m. Broke Montgomery Invitational meet record in the 3200m with a time of 10:47.28. Placed tenth in the Penn Relays 3k. Clocked 10:38.28 in the 2 mile at New Balance Indoor Nationals. Missed entire junior year with injury. Notes: Ranks #1 in the 800m in Montgomery County dating back to 2008. Ranks #6 in the 500m in Montgomery County from 2010 to 2014. Won 800m state titles at three consecutive indoor/outdoor state championship meets. Holds Viking Invitational meet record in the 800m. Contributed to a state champion 4x800 relay. 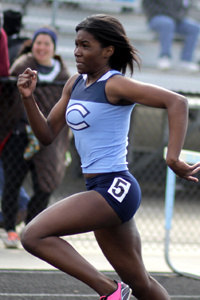 Competes for Columbia University where she has run 1:14.96 in the 500m and 2:10.01 in the 800m. Notes: Ranks #1 all-time in Montgomery County in the 300m hurdles. Ranks tied for #1 from 2010 to 2014 in the 100m Hurdles. 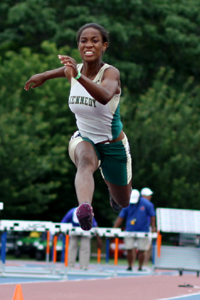 Won 100-meter hurdles county title in fastest time by MCPS athlete since 2007. Broke outdoor county championship meet record in the 300-meter hurdles in 44.41. 2014 state-winning 300-meter hurdles time of 43.17 is #7 all-time at the state meet and #1 all-time by a Montgomery County athlete at state meet. 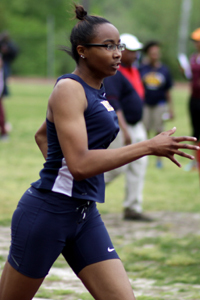 Notes: Ranks #2 in the 55m, #4 in the 200m, and #5 in the 100m in Montgomery County from 2010 to 2014. Is two-time county and region champion in the 55-meter dash. Senior year claimed 55-meter 4A state title by more than two-tenths of a second. Qualified for 100-meter finals at four consecutive outdoor state meets. 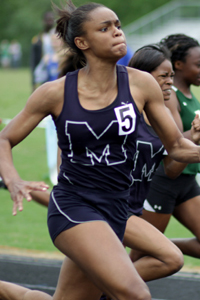 Senior year contributed to Magruder's team state title and state champion 4x100 and 4x200 relays. Notes: Ranks top 10 in six major events in Montgomery County from 2010 to 2014. Ranks #4 in the 100m, #10 in the 400m, #4 in the 500m, #9 in the 55m hurdles, #9 in the 100m hurdles, and #2 in the 300m hurdles. Owns two individual state titles and contributed to 4x400 state title. Competes for Harvard University. 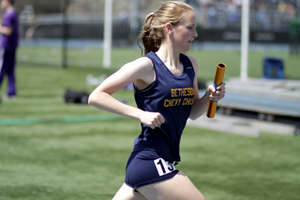 Notes: Ranks #3 in the 1600m and #4 in the 3200m in Montgomery County from 2010 to 2014. Won 1600m and 3200m WCAC titles at Holy Cross before transferring to Walter Johnson. Anchored a state champion 4x800 relay and anchored the fastest Distance Medley and 4xMile relays in Montgomery County from 2010 to 2014. Won 1600m indoor state title in 5:07.39 and dropped to 4:59.28 to win outdoor county title. 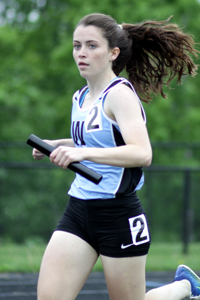 Won 4A West Region 3200m title in 10:49.36 to become third Montgomery County girl to ever break 5:00 in the 1600m and 11:00 in the 3200m. Notes: Ranks #3 in the 3200m, #6 in the 1600m and #10 in the 800m in Montgomery County from 2010 to 2014. 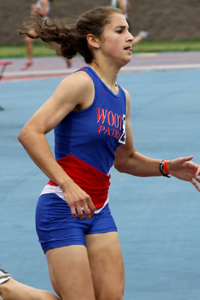 During junior year, had the best kick of the day at the outdoor state championship where she claimed state titles in the 1600m and 3200m. 3200m time of 10:45.68 is #9 all-time at the state meet and #4 by a Montgomery County athlete at the state meet. Notes: Ranks #1 in the long jump in Montgomery County dating back to 2005. Won county titles in the long jump as freshman and senior. Picked up triple jump as senior and won 4A West title. Won state title in the 4x400. 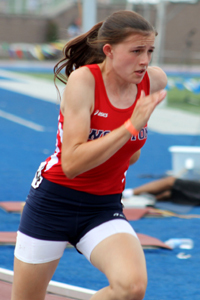 Attends University of New Mexico where she has jumped 19-10.75 in the long jump and 40 feet in the triple jump. 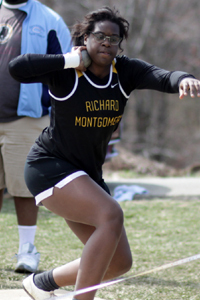 Notes: Ranks #2 in the shot put and discus all-time in Montgomery County. Won more county and region titles in the discus than any other Montgomery County athlete from 2010 to 2014. 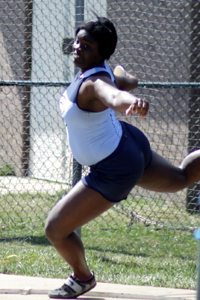 In 2013, broke Woodward Relays 29-year-old meet record in the shot put relay with Tiffany Afolabi-Brown (74'10" combined distance). 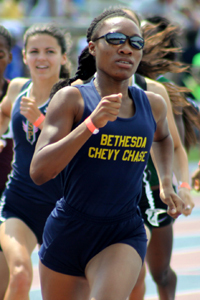 Notes: Transferred to Bullis as senior and dethroned Olivia Ekponé as MoCo's best all-time in the 300-meter dash. 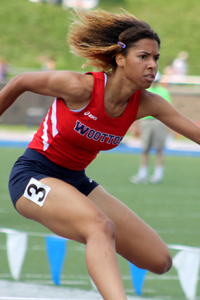 Also ranks #3 in the 55m and 200m in Montgomery County from 2010 to 2014. 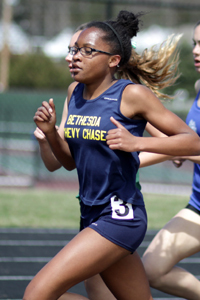 Won 200m and 400m ISL titles with meet record in the 200m, leading Bullis girls to first ever ISL team title. Alexis Postell, Simone Glenn, Kyla Lewis, and Gabrielle Tielman-Fenelus won the Taco Bell Classic 4x100 in South Carolina in 47.35. 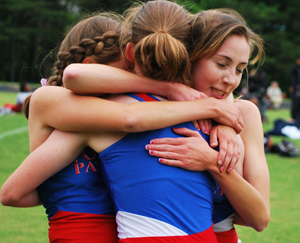 The same girls went on to finish third in the Small Schools Championship of America at the Penn Relays in 47.54. 4x200 indoor and outdoor state champions, India Knight, Olivia Ekpone, Britt Eckerstrom, and Camry Torian traveled to North Carolina to take 2nd place at New Balance Outdoor Nationals in 1:38.86. It is likely the fastest time ever recorded by a Montgomery County team. 4x400 indoor and outdoor county, region, and state champions, Tiara Wellman, Britt Eckerstrom, India Knight, and Olivia Ekpone went all-in at the state championship to claim the Maryland State Championship Meet Record in 3:46.22. It is likely the fastest time ever recorded by a Montgomery County team. Corinne Duvall, Jessie Rubin, Andrea Maxwell, and Grace Corbett shaved over five seconds off the Maryland State Championship Meet record which still stands today. It is likely the fastest time ever recorded by a Montgomery County team. Helen Webster, Abby Fry, Caroline Beakes, and Laura Nakasaka broke the Woodward Relays meet record with an average time of 5:29 per runner. 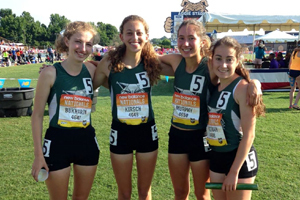 After selections were already made for this Half-Decade Team, Katriane Kirsch, Irina Bukharin, Emily Murphy, and Kiernan Keller traveled south to New Balance Outdoor Nationals and placed 11th in the 4x1 Mile relay with a time of 20:49.81. It is likely the fastest time ever recorded by a Montgomery County team. Camry Torian, Naomi Sheppard, Kennedy Knight, and Tiara Wellman still hold the SMR meet record at the 12-year-old Cougar Relays. Melanie Cirillo, Kiernan Keller, Emily Murphy, and Victoria Gregorio broke the meet record at the 12-year-old Cougar Relays this year. As I acknowledge and respect the identified half decade athlete list of female athletes, I cannot refrain from mentioning that there were a few athletes who should have received honorable mentioning especially Lauryn Perpall of the Academy of a Holy Cross. Has anyone else noticed how much the Moco girls have improved these past few years? Let's take Katie Wolf as an example. Her top 2010 times beat her top 2007-2009 times. 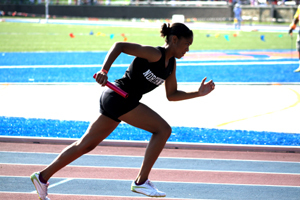 However, she didn't even crack the top 20 in the 2010-2014 Girls Half-Decade Track & Field Team (a 5 year period), whereas she made the top 15 athletes in the 2000-2009 Girls All-Decade Track & Field Team (a 10 year period). In other words, the Half-Decade Team would soundly defeat the Decade Team in a dual meet despite having only half as many years of performances. Keep it up, Moco. Thanks for putting Stephanie Davis in your honorable mention category. 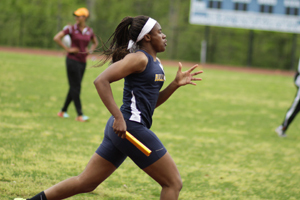 Although she had to go to a private school her last two years, her exploits in Montgomery County track and field form 2014-2015 were legendary. Winning the 100/200 (2014)as a freshman at States and winning the 200 again in 2015 placing 2nd in the 100. 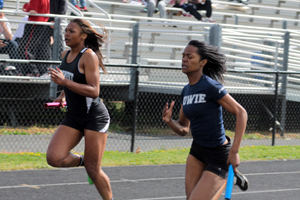 I am quite sure if she had of stay at Magruder High School, she would be mentioned on the Girls Half-Decade Track and Field Team along with her buddy and teammate Bethany White.